Three out of my four (and some) years were spent within the walls of the homey concrete residence halls (lovingly referred to as "dorms"). Living on campus freshmen year was akin to going to an out-of-state university (according to my parents); soon after I moved into the room half the size of mine in Renton, it became mine and two other students' home away from home. My independence and love for freedom sky-rocketed and lead me to pursue employment as a Resident Adviser Now I would never have to leave campus. Serving as a resident adviser is a fairly extreme first job. I was physically and mentally challenged by the countless number of rounds around the building, late night fire evacuations for burnt popcorn, and the all-too-occasional policy enforcement. Working (and living) with 120 other students also stretched me emotionally-- helping them deal with the challenges I dealt with, and cope or find resources for the ones that I didn't. Confronting and interacting with residents under both professional and peer environments was a huge level up in my ability to handle different, and sometimes difficult, personalities. As a resident adviser my sophomore and junior year, my experience molded me both as a professional and as a student. The artifact here is a picture capturing one of the many perks of being an Honors Resident Adviser-- Dinner with the President! 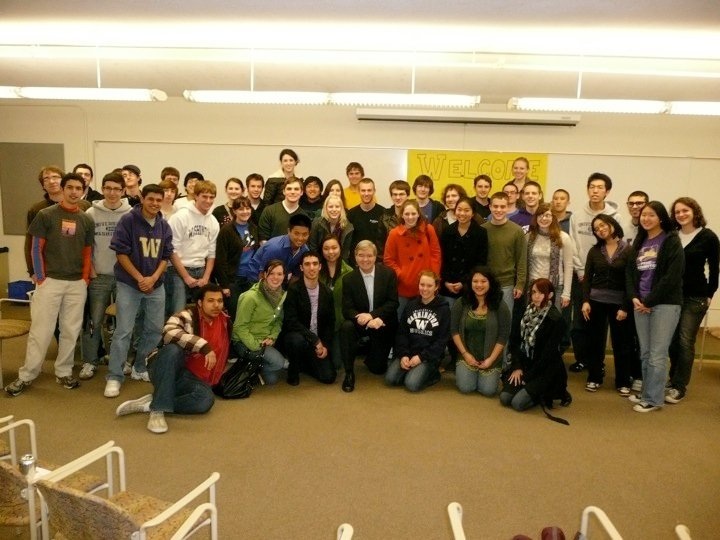 This was taken in March 2010, President Emmert's last year at the University of Washington. Hard work and perseverance allowed us to continue this annual tradition.